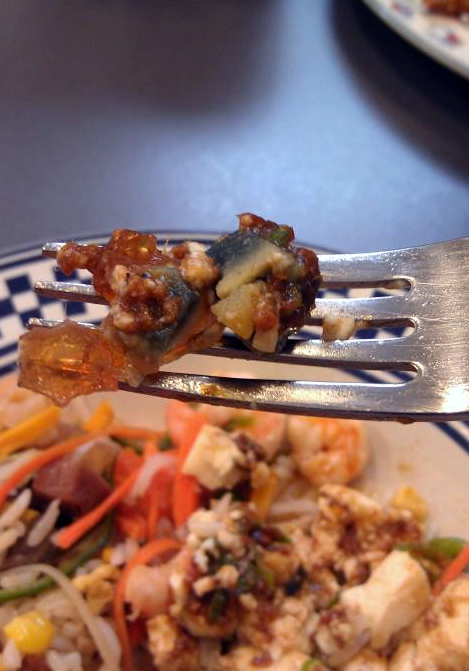 Century egg with tofu and pork floss salad is a very traditional Taiwanese appetizer. 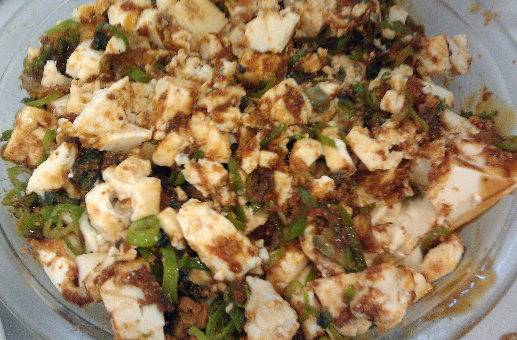 Place the tofu cubes on a plate, then lay the century egg pieces on top. Sprinkle a handful of pork floss and Katsuobushi flakes all over. Drizzle the sesame oil, oyster sauce and sweet soy sauce evenly across the dish. Sprinkle on the chopped spring onion. Mix it all up before serving. **Pork floss – Chinese dried and sweetened pork, separated into very small fibre strings, with a light and fluffy texture. Posted in Food Diary, Recipes and tagged appetizer, Asian food, century egg, Century egg recipe, Century egg with Tofu and Pork floss salad recipe, Chinese appetizer, Chinese food, chinese preserved duck egg, Chinese salad, 皮蛋, 肉鬆, Food diary, Food photos, food review., hundred-year egg, HUNGa busta, katsuobushi, meat floss, meat wool, millennium egg, oyster sauce, pork floss, pork floss recipe, pork sung, recipe, Rousong, Salad, sesame oil, silken tofu, Soft tofu, soy sauce, spring onion, sweet soy sauce, Taiwanese appetizer, Taiwanese appetizer recipe, Taiwanese food, Taiwanese salad, Taiwanese salad recipe, thousand-year egg, thousand-year-old egg, tofu recipe. Bookmark the permalink.